You are here: Home / Great Deals / My New Space Saving Keurig! I got some fun new toys over Christmas and I thought I would share one with you today since we have been talking about space saving. I had a coffee pot that I loved! It was one that you push your cup into the dispenser and it fills your cup. I really loved it, but my DH doesn’t drink coffee, and my older kids have all moved out and the youngest doesn’t drink coffee either. So, that left me trying to adjust and make 1 cup a morning for me – well, 1 LARGE mug a day for me ! 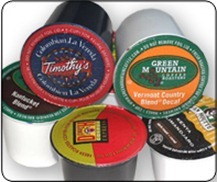 is all the little coffee pks and cups sitting out not taking up more room than the old maker? don’t get me wrong i sooooooooooooooooooooooooooooo want one too i’m just afraid i’ll spend to much money on the little coffee thing majiggers. lol… plus you still have to buy the creamer……. i MIGHT get on board if they had creamer and all already added. btw…… congrats to you! it sure is pretty 😉 and those cups are too too cute! @crystal: I was thinking the same thing Crystal! LOL But, I don’t have to store coffee in the pantry anymore cause they are in the holder – so that saves me room, and the cups stacking on the counter save me room in the cabinets! So, maybe I am trading space..I traded the large coffeepot for more room in my pantry and cabinet! I don’t use creamer – but, it’s so cheap or FREE all the time – I wouldn’t worry about that. But, the cups – here are 2 things with that – I just found out I can get the cups on Amazon.com – and with my Swag bucks – I can get them FREE! Nice! But, my DH also bought me a permanent filter in case I ever want to buy ground coffee and use it instead of the cups – and depending on the sales I just might! Target in Sherman has the Keurig Pumpkin Spice Coffee on the clearance I think it said $3.43 … I wish I knew some people who would have liked that cause there was a bunch. We have a Keurig but not interested in funky flavors.. Just wanted to pass this on…. @Michelle Peacock: Thanks! I don’t like weird flavors either but I know people do like pumpkin – thanks for sharing!